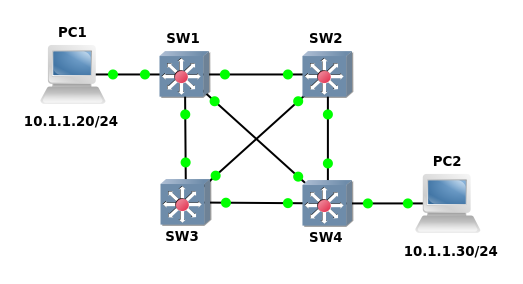 The first of these topics is a review of how a switch forwards a frame through the network. This is one of the fundamental topics covered in the ICND 1 exam, however if you do not have a clear understanding of the logic then you will find the topics covered in the ICND 2 exam, and in everyday trouble shooting, very difficult to grasp. Each of the interfaces between the switches are configured as 802.1Q trunk ports allowing all VLAN’s over the trunk. Each of the interfaces connecting to the VPCS PC’s are configured as access interfaces in VLAN 10. To show the logic of how a switch forwards a frame I will ping PC 2 from PC 1 and use the output of the “show mac address-table” command to demonstrate the forwarding process. So PC 1 has now sent the first frame which will be an ARP request to find the MAC address of 10.1.1.30. The following steps describe how the frame is forwarded through the network. If the frame arrives on an access interface, the switch will use the VLAN configured on the access interface. If the frame arrives on a trunk interface, the switch will use the VLAN defined in the 802.1Q header. In the case of our example the frame arrives on interface eth 1/0 on SW1 which is configured as an access interface using VLAN 10. Now that the switch knows what VLAN the frame belongs to, the next step is to add the source MAC address to the MAC address table with the incoming interface and VLAN id details. Remember in this case no previous frames have been received, so the source MAC will not be in the MAC address table on SW1. If the destination MAC address is found in the MAC address table for the VLAN identified in step 1, the switch will forward the frame out the interface listed in the MAC address table. In our example because the frame received on interface Eth 1/0 on SW1 is a broadcast ARP request ( destination MAC ff:ff:ff:ff:ff:ff), the frame will be flooded out all interfaces belonging to VLAN 10. Eth 0/0 The frame will be flooded because the interface is in a Spanning tree forwarding state and the VLAN is active on the trunk and not pruned. Eth 0/1 The frame will be flooded because the interface is in a Spanning tree forwarding state and the VLAN is active on the trunk and not pruned. Eth 0/2 The frame will be flooded because the interface is in a Spanning tree forwarding state and the VLAN is active on the trunk and not pruned. Note that the frame is not forwarded out the access interface Eth 1/0, this is because a switch will broadcast frames out all interfaces in the VLAN except the interface upon which the frame was received. Because interface Eth 0/2 is a trunk interface, SW4 will look at the 802.1Qq header to determine what VLAN the switch belongs to. In the case the VLAN id will be 10 as that is what SW1 would have set the 802.1Q VLAN id to before broadcasting the frame out over its Eth 0/2 interface. Now SW4 will look at the destination MAC address, in this case it is a broadcast MAC address so the Switch will flood the frame out all interfaces in VLAN 10 except the interface it was received upon. Eth 1/0 This is an access interface and is in a STP forwarding state. The frame will not be flooded out Eth 0/2 as this is the incoming interface. It will also not be flooded out of interface Eth 0/1 and Eth 0/2 because these interfaces are in STP blocking state and the Vlan is not active on these trunks. So now PC 2 will receive the flooded ARP request and determine that the request is destined for the IP configured on Eth 0 on PC 2. PC 2 will then generate an ARP response frame to send back to PC 1. SW 4 receives the ARP response frame from PC 2, this is an access interface in VLAN 10 so the switch knows that the frame belongs to VLAN 10. Because the MAC address for PC 1 is listed in SW 4’s MAC address table SW 4 know that it can forward the frame out of interface Eth 0/2 as a unicast frame. SW 1 receives the ARP response frame from PC 2, Eth 0/2 is a trunk interface so the switch looks at the 802.1Q header to determine the VLAN id. So now the switch knows that the frame belongs to VLAN 10. Because the MAC address for PC 1 is listed in SW 1’s MAC address table SW 1 know’s that it can forward the frame out of interface Eth 1/0 as a unicast frame. Pc 1 then receives this frame and the process is repeated agin for each frame that is sent from PC 1 to PC 2.